The United States is in the midst of a new chapter in policing. In several very public cases, police have made fatal errors with regard to identifying criminal suspects and have shot and killed unarmed citizens by mistake. Societal outrage, protests and debates have ensued as these types of episodes continue to occur, reigniting important conversations about racism, socioeconomic divides, and policing budgets. Unfortunately, there is a major aspect of contemporary law enforcement that rarely makes an appearance in the ongoing conversations about policing; the communications landscape within which police systems are embedded, and the complex interrelationship between the police, their communications systems, and the people that they serve and protect. 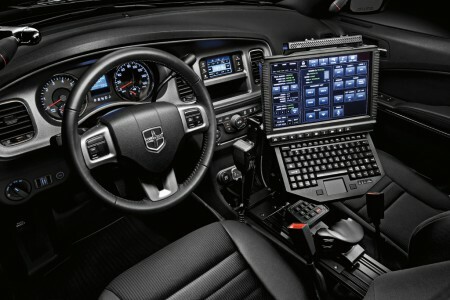 Police vehicles contain massive amounts of communications equipment, and it is worth examining whether or not communications equipment in police vehicles is standard between vehicles; which equipment is actually used frequently; and how officers are operating communications equipment during their shifts. In addition, the attention range and scope of police officers and their communications equipment should be examined in the context of critical situations. Many municipalities cite reduced budgets as the reason for "streamlined" (lean) processes for officer-to-police vehicle ratio and communications and dispatch processes. It will be helpful to learn if these processes create isolation, fragmentation and attention distraction for police officers during their shifts. The contemporary policing communications landscape is highly complex, with maps, tracking, constant multi-perspective messaging, and other forms of data. Policing can benefit from being examined through the lens of PolySocial Reality (PoSR), a theoretical model of messaging networks emerging from multiple, multiplexed, synchronous and asynchronous communications. A common thread amongst the recent police shootings seems to be that of detachment: police have shot people who were unarmed and often at a distance. The incidents seem irrational in that many victims appear not to have been a real threat, yet officers seemingly did not try to use other means to capture them. A close examination of police communication methods could contribute to a richer understanding of the behavior and decision making of law enforcement officials. This could be conducted using ethnographic methods to observer the types of messages transmitted and received by officers, observing laptop, radio and aural communications in context. For 100 years, people who wanted to talk to other people were wired to their homes...chained to their desks, and really didn’t have much in the way of freedom. We were, in fact, giving people communications in their vehicles, but even then that’s not much better than being tied to your desk, you’re still trapped in your car. So we found out from people like the Superintendent of Police of Chicago who told us that he had a real problem, the officers had to be in communications, the only way they could talk was to be in their cars and yet the people they were protecting were walking on the streets. He asked us, “how can I have my officers connected and still mingling with the people?” We discovered this was true of people in managing airports, people managing businesses, real estate people. So we became aware of the fact that real communications is portable communications. Put the device on the person (Big Think 2010). Cooper is said to have come up with a clip-on microphone solution that officers could use within walking distance of the car “base.” “That’s when I really made the discovery that is my mantra today,” said Cooper. “That people are fundamentally, inherently mobile, that these policemen were much, much more effective when they could carry their radios with them than when they were trapped in cars” (Macaulay 2013). In 2015, it appears that police officers are once more "trapped" (usually alone) in their cars. This could be due to a combination of factors. Trends in management science toward "lean processes" seem to have been adopted by decision makers, looking for ways to shrink staff and attempt to optimize officer performance. Police officers are rarely policing the community while being immersed in the community on foot or by bike; they are more often in police vehicles, where they receive information via radios, attached either to their person or to their vehicle. Police officers many not be in a consistent location long enough to observe unreported crimes or to view crime patterns over time (Applin 2015), nor are they afforded time or opportunities to engage with locals. Many police officers do not live in the communities they are policing, and may work in different communities day to day, covering for others who are out sick or on vacation. When a police officer is unfamiliar with a community and does not have local knowledge, they may make assumptions in its absentia, thinking that what they know of other communities is applicable and/or transferable, when it may not be. An officer who is alone in a car, as many are, and feels tethered to that car, has limited methods for interacting with or capturing suspects. The problem is exacerbated when officers may not want to leave their cars, which seems to be increasingly so, especially in neighborhoods that they may not be familiar with on a daily basis. For example, the only way an officer in a police vehicle can communicate with a suspect on the street is with a loudspeaker. If the suspect doesn't appear to comply immediately, the officer’s next step may be to call for backup and to chase the suspect in the car until the suspect surrenders — and then, if the suspect doesn't surrender, to fire from the car or from near the car or from within a “safe” radius, or to simply use the vehicle as a weapon directed towards the suspect. Thus, it appears that policing (suspected) street crime has turned into armchair — or rather, armed vehicle — pursuit where police officers stalk a target from the safe perch of their vehicles. There seems to be little physicality (or humanity) to these “enforcements” — just reactive shooting from the safety and detachment of a police car that itself may be transient in a community. However, police vehicles aren’t just physical safe havens or shields. They contain the vast amount of up-to-the-minute data and information considered crucial to assess situations. Police officers are, indeed, tethered to their cars like cyborgs. Indeed, policing has become data driven, like so many other facets of today's society. What is missing is the physicality of “walking a beat” and the consistency of knowing a community, rather than assuming knowledge of a community. Police officers require access to the vast data available at their fingertips, and only accessible in their cars, because they may often be in unfamiliar neighborhoods. If this is so, police officers may also have less and less stake in communities as a result, and hence could have less and less stake in the outcome or accountability of their actions. When officers are walking a beat they use radios to receive information via an "agent," and data delivered through this linear audio channel seems limited when compared with the breadth of audio and visual data accessible on a police vehicle laptop. Whether officers are encased in a police vehicle or walking a beat with a steady stream of audio data, the practice of policing almost inevitably results in Divided Attention. ‘Divided Attention’ is a term used to describe the cognitive state of people when they are trying to direct attention to multiple tasks — often between mobile phones and the "real" world. Divided Attention can produce all sorts of outcomes, but the principal one is mistakes. People just can't competently communicate using a mediated device and simultaneously interact within their local present. All sorts of research backs this up and there are any number of Divided Attention papers and studies that prove that we can't converse and act at the same time, particular using interactive communications technology, when we are either walking or driving (Hyman, Boss and Wise et. al. 2009; Strayer and Johnston 2001; Strayer, Drews and Johnston 2003; McCarley, Vais and Pringle et. al. 2001). In Williams-Sonoma, the chain of high-end cookware stores, the salespeople have started to wear headset radios (as police do) to maintain constant chatter with their colleagues regarding business and inventory in the store. I interviewed a female employee at Williams Sonoma about her radio. She said when it was turned on, which it was required to be during her shift, it was impossible to concentrate and she made a lot of mistakes due to having to listen to a radio constantly while simultaneously interacting with customers. Police officers cannot be fully aware in the moment if they are constantly jacked into an entire shift of mandatory listening to radio chatter and returning communications. This is Divided Attention. Because police officers are distracted, it is easy to make mistakes about mentally reconciling what they hear with what they are seeing. If police officers are enmeshed in these communications procedures and processes during their shifts, logic dictates that they simply cannot pay full attention to the "scene" while in that state. Not only are police officers dividing their attention, but they are doing so via multiple, multiplexed, fragmented messages on multiple, multiplexed channels. However, it isn't just Divided Attention that could be inhibiting police perception of events, it is Divided Attention within a PolySocial Reality (PoSR) context. Applin and Fischer (2011-2015) propose PolySocial Reality (PoSR) as a framework for representing complex synchronous and asynchronous messaging contexts (Applin 2015; Applin and Fischer 2011, 2012a, 2012b, 2013). PoSR substantially describes the overlapping network transaction spaces that people traverse synchronously and asynchronously with others to maintain and use social relationships via various apps, mobile services, sensors, platforms, technologies and conversation spaces. PoSR represents the complexity people (and machines) encounter in negotiating a connected world while managing more relationships in terms of the layering and density of connections between correspondents via aural or textual communications. PoSR is useful for exploring human adaptation and consequent behavior change when what were formerly largely synchronous communication events become embedded within a communications environment that is increasingly asynchronous along the streets and sidewalks of our communities (Applin and Fischer 2013). During any particular incident, officers are managing communications related to that single event as well as monitoring communications regarding other incidents and other officers, all while seemingly participating in events unfolding in front of them, or at least to some degree they are witnessing them taking place. Messages can be crossed. When pursuing a suspect, a police officer listening to a radio simultaneously, may confuse one audio incident with another. When the brain is distracted and concentrating on multiple inputs that require complex cognitive sorting, it is easy to see how an unarmed suspect might appear to be armed and dangerous even when they are not. As a solution, it has been proposed that officers wear cameras to record transactions. This is a step that may help in that at least events can be recorded and referenced, but it is still may only be useful after an incident causes a lost life. Video cameras cannot record the PoSR-embedded interaction, of all multiple channels and formats at the same time of an incident, which is part of the distraction and Divided Attention. One effective way to change the sometimes-fatal outcome of this communications quagmire is to supplement PoSR communication for learned knowledge of communities. If officers to return to becoming familiar with the communities that they police, and to build relationships with community members, they will develop a foundation of knowledge of the environment that they patrol. By becoming participant observers, police officers could better understand each community they patrol and supply enough incorporation of the 'local' there to offset the technology that is competing for their senses and cognitive capacity. Even if in early stages, this just took the form of one or two weekly 'clinics' in the community, knowledge and relationships would be enhanced. Once there is mutual trust and understanding between officers and the community, it may be easier for officers to frame PoSR related communications within a known context, inferring the missing information contexts that arise from fragmented communications. Secondly, having another officer in a vehicle will greatly reduce cognitive load. One officer can monitor the PoSR outcome of communications, while the other officer is perceiving the scene and operating the vehicle. Together, officers can then make more rational decisions about strategy and tactics regarding each incident. This may reduce cognitive overload on individual officers who are monitoring suspects, monitoring massive complex multiplexed multiple messages, and driving a vehicle simultaneously. Police departments might balk at adding another officer per vehicle, but I would argue that this is likely much less expensive than the multiple lawsuits they find themselves facing repeatedly over avoidable officer mistakes. To summarize, in addition to the regular policing tasks of patrolling areas and responding to incidents, police officers are required to maintain and participate in multiple, multiplexed, asynchronous and synchronous communications as part of their daily work environment (Applin and Fischer 2012b, 2013). Due to Divided Attention and outcomes from instances of PolySocial Reality (PoSR), police officer attention is being fragmented. It is possible that this fragmentation of attention is impacting police officer perception of both events and suspect behavior. hiring ethnographers to conduct research that uses ethnographic methods to understand the complexities police officers face in communication, which would enable the full role of police officers on patrol to be more fully understood and could provide clues as to ways of improving police vehicle "experience" to optimize focused attention. Together, these techniques will improve public and officer safety, rather than having single police officers alone in police vehicles burdened with responding to a plethora of inputs, and visual stimuli along with having to operate a vehicle, pursue and capture suspects simultaneously. Big Think, 2010. How a Pop-Bottle Invention Resulted in the Cell Phone (available on-line: http://www.youtube.com/watch?v=SUIuXoZs7hU, accessed 27 November 2013). Macaulay, S. 2013. The Cellphone Turns 40: Remembering Martin Cooper’s Historic Call. The Daily Beast (available on-line: http://www.thedailybeast.com/articles/2013/04/03/the-cell-phone-turns-40-remembering-martin-cooper-s-historic-call.html, accessed 12 May 2013). Applin, S.A. 2015. Doctoral Thesis. Untitled. Forthcoming. Hyman, I., Boss, S., Wise, B., McKenzie, K., and Caggiano, J. 2009. Did You See the Unicycling Clown? Inattentional Blindness while Walking and Talking on a Cell Phone. Applied Cognitive Psychology 24 (Oct 2009), 597-607. Strayer, D. L. and Johnston, W.A. 2001. Driven to distraction: Dual-task studies of simulated driving and conversing on a cellular phone. Psychological Science, 12,6 (November 2001), 462–466. Strayer, D., F. Drews & W. Johnston 2003. Cell phone-induced failures of visual attention during simulated driving. Journal of Experimental Psychology: Applied 9, 23–32. McCarley, J., M. Vais & H. Pringle et. al. 2001. Conversation disrupts visual scanning of traffic scenes. In 9th Vision Vehicles Conference, Brisbane, Australia. 2001. Applin, S.A., Fischer, M.D. 2011. A Cultural Perspective on Mixed, Dual and Blended Reality. In Workshop on Location-Based Services in Smart Environments (LAMDa’11) in Proceedings of the 16th International Conference on Intelligent User Interfaces (IUI’11), Palo Alto, CA, Feb.13-16, 2011. ACM, New York, NY, 477-478. Applin, S.A., Fischer, M.D. 2012a. PolySocial Reality: Prospects for Extending User Capabilities Beyond Mixed, Dual and Blended Reality. In Workshop on Location-Based Services in Smart Environments (LAMDa’12) in Proceedings of the 17th International Conference on Intelligent User Interfaces (Lisbon, Portugal, Feb. 14-17, 2012) IUI ’12. ACM, New York, NY, 393-396. Applin, S.A., Fischer, M.D. 2012b. Applied Agency: Resolving Multiplexed Communication in Automobiles. In proceedings of the 4th International Conference on Automotive User Interfaces and Interactive Vehicular Applications (Automotive UI '12). Workshop: The Social Car. In cooperation with ACM SIGCHI. Portsmouth, NH, Oct. 17-19, 2012. Applin, S.A., Fischer, M.D. 2013. Asynchronous Adaptations to Complex Social Interactions. IEEE Technology and Society Magazine, 32(4), winter 2013, pp. 35-44, 6 Dec. 2013.